DumaTau is built under cool mangosteen trees overlooking an enormous lagoon. It is located just east of the source of the Savuti Channel and several kilometres west of Kings Pool Camp. The camp falls within the 125,000 hectare Linyanti Wildlife Reserve and lies along the bank of the Linyanti River. Directly across this river to the north is the Caprivi Strip - part of the country of Namibia. The camp is also within driving distance of the Savuti Channel and game drives to the channel are highly recommended - we have seen some of the most amazing predator interactions anywhere by driving through the Savuti channel. DumaTau is owned and operated by Wilderness Safaris. Accommodation is in ten luxurious, raised, tented rooms under thatch with en-suite facilities including hot and cold running water, flush toilets and shower. Each room has an additional outdoor open air shower for those who prefer to be closer to nature. There is a dining room, pub, lounge, a plunge pool and a guest "loo" with a fantastic view. Complimentary laundry services are provided. DumaTau offers day and night game drives along the Linyanti River and within the Savuti Channel as well as short nature walks. 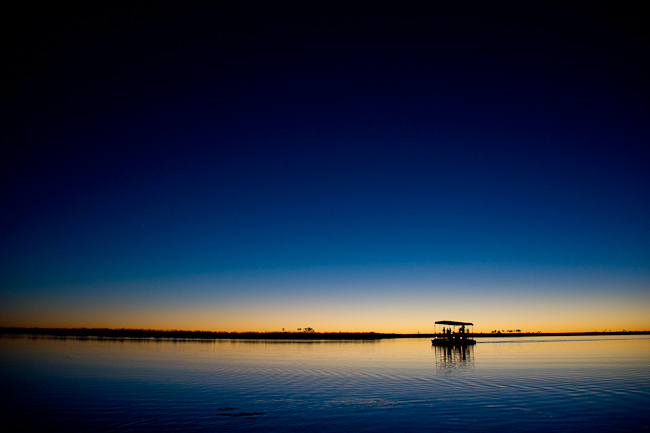 The camp's boat allows guests access to the waterways to observe the Hippos at close range (water levels permitting). There are a number of hides in the area which give guests the opportunity to observe and photograph animals close up in their natural environment without disturbance. Elephants are one of the area's biggest attractions, especially in the dry winter months, along with the Red Lechwe, Zebra, Wildebeest, Impala, Waterbuck, Sable, Roan Antelope, Eland, Giraffe, Baboon, Monkey, Warthog, Crocodile and Buffalo. Then there are the predators: Lion, Leopard, Cheetah, Wild Dog and Hyena - as well as the smaller predators like African Wild Cat and Caracal. Because night drives are allowed within the Linyanti, many nocturnal animals like Bush babies, Spring Hare, Aardwolf, Serval, Genet and Pangolin can regularly be seen. Birding is outstanding here - from the Okavango "specials", such as Slaty Egret, Whiterumped Babblers and Wattled Cranes, to the Bushveld species. Kori Bustards and Ostrich are regularly seen on forays into the Savuti Channel. The Savuti Channel - just to the west of camp, is renowned for its predators - especially Lions and Hyenas. Cheetahs are also commonly seen in the channel as it provides a perfect open-grassland hunting ground for these cats to chase down their favorite prey - Impala. The 125 000-hectare (308 000-acre) private Linyanti Concession bordering Chobe National Park's western boundary is an enormous, wildlife-rich area, shared between just three small camps (DumaTau, Kings Pool and Savuti), which creates an unrivalled atmosphere of remoteness and space. There are three main features of the Linyanti Concession: the Linyanti River, the woodlands of the interior and the well-known Savute Channel, famous as a sporadic and unusual watercourse. The Channel stopped flowing between 1980 and 2008; during this time it was an open grassland, home to a wide variety of animals. In 2008, the Savute Channel once more flowed, creating a water source that rapidly filled with aquatic life, wide varieties of waterbirds, and hippo, amongst other changes. With two-thirds of the Channel located in the concession, Wilderness guests have private and exclusive access to its abundant game. These three features together with the floodplains, woodlands, grasslands, palm islands and scrub vegetation of the area harbour one of the densest dry season concentrations of elephant in Botswana - at times the Linyanti must have several thousand elephants roaming around. This phenomenon is one of the main attractions for travellers to northern Botswana, but the area is also important in holding good numbers of predators, providing an integral stronghold for species like the critically endangered wild dog, as well as lion, cheetah and spotted hyaena. The roan antelope found in the area can provide an equal thrill however, as can the high concentration of birds of prey, seasonal zebra congregations and the cathedral-like woodland of mature mopane trees. Aside from roan, other plains game includes red lechwe, Burchell's zebra, blue wildebeest, impala, common waterbuck, sable, eland, southern giraffe, chacma baboon, vervet monkey, warthog, hippo and Cape buffalo. Nocturnal species often seen are lesser bushbaby, spring hare, aardwolf, serval, large spotted genet and if you are extremely lucky the elusive pangolin! Birding is outstanding here ranging from the Okavango specials, such as Slaty Egret, Hartlaub's Babbler, African Skimmer, Allen's Gallinule and Wattled Crane, to the drier mopane woodland species like Racket-tailed Roller, Bradfield's Hornbill, White-breasted Cuckoo-shrike, Bennett's Woodpecker, Swallow-tailed Bee-eater and Arnott's Chat. This area is also excellent for Kori Bustard, Ostrich, Secretarybird, and Ground Hornbill with Southern Carmine Bee-eaters in summer. The Savute Channel is famous as an area with a high concentration of eagles and raptors and this area is internationally recognised as an IBA (Important Bird Area), particularly for birds of prey like Dickinson's Kestrel and waterbirds. There are also various owl species to be seen here such as Verreaux's (Giant) Eagle-Owl and African Scops-Owl. The many varied habitats within these areas - marshes, waterways, riverine forests, dry woodlands and grasslands - and the prolific and diverse wildlife and spectacular scenery together form a wonderful contrast to the Okavango. Adding this area to a Botswana itinerary makes for a varied and balanced experience of the country and in many ways it is an essential complement to a visit to the Okavango. Perhaps the most topical issue for Botswana at present is its very large elephant population and the possible impact on vegetation and other animal species. As a result and in recognition of the fact that in the Selinda and Linyanti Concessions Wilderness Safaris is responsible for one of the two highest-density elephant concentrations in the country, we have facilitated and partially funded two MSc studies examining vegetation impact and are currently hosting a PhD and further MSc researcher examining additional elements of this puzzle. Botswana has a well-developed network of protected areas, and these include concessions that allow hunting as well as photographic safaris. We have chosen not to hunt in the concessions in which we operate and forfeit approximately US$1.2 million per annum in hunting quotas that we choose not to take up in preference for photographic safaris.